ADORNit Blog Hop!!!!!! With All My Heart: ADORNit Blog Hop!!!!!! 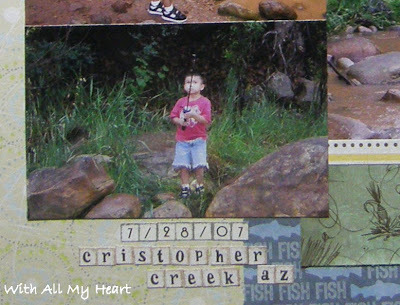 I was so lucky to have some Adornit papers to do a layout with some of my favorites pictures of my son Seth. Living in hot Arizona our summers are HOT, and I mean REALLY HOT, so every year we look for any opportunity to scape from the heat, our favorite activities are camping, hiking and my son loves fishing. There is a little town called Strawberry...we love it there and we visit it as much as we can. Me siento suertuda que pude obtener algunos papeles de Adornit para hacer esta pagina con algunas de mis fotos favoritas de mi hijo Seth pescando. I love working with beads, this time I used wire too. Me gusta mucho trabajar con piedreria, en esta ocacion use tambien alambre. Lately, I've been journaling more; and I'm happy about it. Ultimamente, he estado escribiendo mas en mis paginas, y me siento bien por hacerlo. Thank You so much for stopping by, I had so much fun working on this layout , and I can't wait to start blog hoping. Now go ahead and visit the next blog that belongs to ANAM! Muchas gracias por haber pasado por mi blog, me diverti mucho haciendo esta pagina, ahora voy a divertirme saltando de blog en blog; Tu proxima parada es el blog de ANAM! You should share it with "Scrappintheoutdoors.blogspot.com" Megan is great! 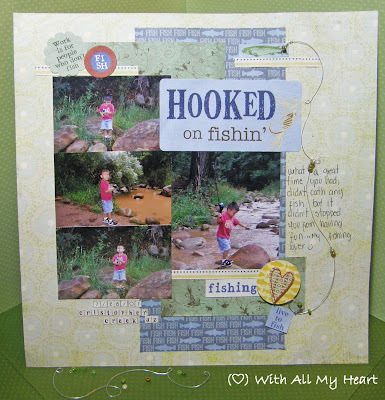 So cute w/ the wire for fishing! Fabulous! Love the wire fishing line. that layout is just gorgeous!!!! Absolutely love the fishing layout! Lots of inspiration for me. Thanks! Great layout! It's so cute! Thanks for letting me stop by! What a cute layout! Great job! awesome LO! I love the details and the beads. Tere I love the LOs. Seth esta tan hermoso. Oh i love this layout and it could be because I designed the paper and it is always fun to see how ppl use it and you did an awesome Job Thanks! 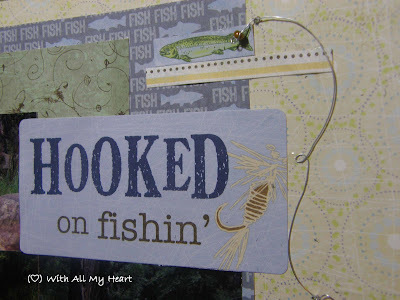 The wire and the beads is such a clever idea - I am going to use this one, thanks so much for sharing it on your blog! que bonito LO, me gustaron mucho los textos, sobre todo el de la ultima foto. Gracias por visitar mi Blog y así darme oportunidad de conocer el tuyo, por aquí te seguiré visitando. 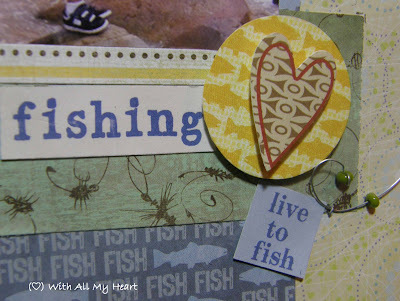 LOVE the fishing page! Found you in the bloghop. Going to follow if that is ok! :) I just love your blog! Hasn't this Hop been fun!! Cute layout, and thanks for visiting my blog! 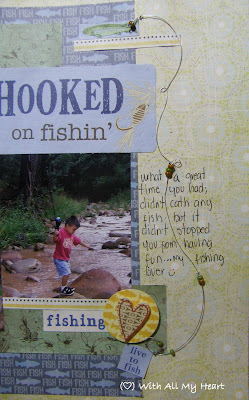 The beads and wire add so much to this payout - great job! Super cute lo and photo! This is such a great layout! Thanks so much for sharin with us at scrappintheoutdoors!!! Tere...gracia a ti por visitarme. Tus trabajos son muy bonitos. Que bueno el grupo de latinas va subiendo. Beautiful page Tere! I love how you did the fishing line.